Film Score Daily: My Vintage Selection for 2013, Part 1! My Vintage Selection for 2013, Part 1! In this first part, we will focus on two decades of film music scores from the Swinging Sixties to the Subversive Seventies. 2013 was generous for Jerry Fielding—and especially, with a Clint Eastwood-related score: Escape from Alcatraz (1979)—and Jerry Goldsmith materials. The Carpetbaggers is a highly dramatical intimistic score that belongs to the 1950’s era tinted with heavy brassy jazzy arrangements coupled with a 1930’s leaning: see “Rina’s Record”, “Sierra Source (Alternate)”, “Sierra Source”, “Separate Trails”, “Monica’s Shimmy”, “Sierra Source Pt. 2”. The saxophone is the instrument that sums up how composer defines jazz into soundtracks. Nevertheless the staccato theme of character Jonas Cord invites itself in many tracks and appears under many forms: see “A Maverick”, “Separate Trails”, “Nevada’s Trouble”, “Movie Mogul”, “Two of a Kind”, “Speak of the Devil”, “New Star”. To create a contrast, the composer adds love themes in the score. One track entitled “The Forbidden Room” is ambitious and dreamlike. But my favorite track entitled “Separate Trails” has a wide range of styles—including a node to “The Great Escape” and “The Magnificent Seven”—but also the dark “Rina’s Dead”. The soundtrack is divided in two: first the original recording and then the 1964 re-recording. The Man from FSM Lukas Kendall is credited as a project consultant. Who's Got The Action? is a minor, comical—in the cartoonish sense of the word—and composite but pleasant score. Duning toys with big band merry melodies and sweet romance music while injecting some foreign folklore colors: Spanish-flavored (see “Roza”, “Good Morning, Mr. Flood”, “Alimony Bridge”), Nippon-flavored (see “Bright Idea/Incense and Saki”, “Japanese Record”), French-flavored (see “Bastille Day/Finale”) and Italian-flavored (see “La Scala”). We can even spot a trace of Ragtime in “Passing the Scratch”. The main theme reappears under many guises all along. To conclude this soundtrack, we get two excerpts, one by Beethoven and one by Brahms. My favorite tracks remain the suspenseful one “Clutch in Dutch” and the mallets-oriented “Shaky Clutch/Bookie Blues”. I find the intimistic parts better than the blatant funny tunes. Sometimes, this score is so light that you can confuse it with an easy listening work. The Man from FSM Lukas Kendall is credited as a co-executive album producer. 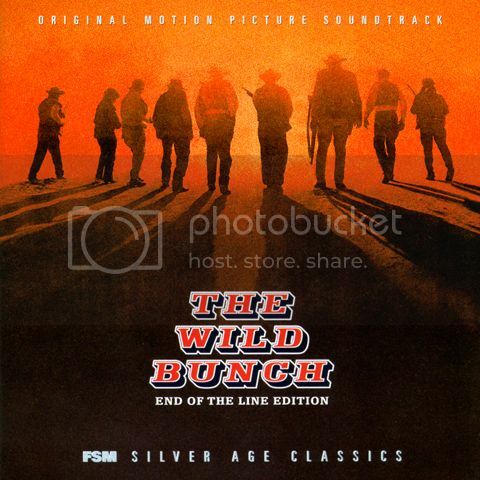 The Wild Bunch is Jerry Fielding’s masterpiece and is Film Score Monthly’s greatest achievement. Some devices go back to the composer’s Titus (Cf. Shane) and Desilu scores (Cf. Star Trek, Mission: Impossible and Mannix) but, here, they’re expanded and hardened. Only Greig McRitchie is credited as orchestrator hence no Lennie Niehaus. This 3-CD set contains the original recording that is different from the 1998 Warner Bros. version (listen to “Angel Confronts the Gorch Brothers/1st Denver Hotel” and “Denver Flashback” that feature a haunting banjo overlay effect simulating a feeling of nostalgia), alternate and additional music and the album version to conclude coupled with demo versions and few extras. see “Main Title”, “They Cleared Out”, “Slow Motion Tumble”, “All Clear”, “Entrance of the General”, “Assault on the Train and Escape”, “Angel Blows his Cork”, “Give it to Him”, “Adventure on the High Road”, “Bounty Hunters”, the arch-drum solo “Attempt to Save Angel”, “Dirge and Finale” and “The Long March” (Alternate & Additional Music). This percussion leaning is present in all his Desilu’s series: Star Trek, Mission: Impossible and Mannix. see “Judas Goat”, “Angel Confronts the Gorch Brothers”, “Menace/Adventure on the High Road”, “He’s a Thief”, “Is That Sykes?”. This is “the” vintage release of the year, and, if you have to select one single score, try this one on the spot! Above all, it’s a testament to quality and innovation. → Shock Treatment is first an experimental exercice (featuring piano phrases that are sped up or reversed and electrified or echoplexed instruments) and then the template for torn-inside scores to come: Seconds, The Mephisto Waltz and The Reincarnation of Peter Proud. Here and there, you recognize traces from “The Invaders” from The Twilight Zone to scores from Thriller and Freud. Oddly enough, the macabre leaning and its orchestration will become an archetype overused by Billy Goldenberg at Universal television in the early Seventies: Cf. Suitable for Framing. The Man from FSM Lukas Kendall is credited as a co-producer. → Fate is The Hunter is the minor side of this double header but it’s still a lovely and delicate score filled with sorrow and dominated by strings. Seven Days In May is a brief score lasting fifteen minutes on the clock and that is mostly martial and minimalist-oriented. Apart from the vivid main title executed by a series of percussions, the soundtrack is mostly atmopheric, low-key and suspenseful to highlight the suspicion and anxiety of the official characters. The use of piano and mallets play an important role in the orchestration: see “Midnight Rendezvous”, “The Meeting is Over”, “Secret Rendezvous”. In the finished film, some tracks are not fully heard and even a piece of stock music (“Home Again, 1952”) from composer David Amram’s The Manchurian Candidate is used in one scene taking place at the El Paso Café through a brassy jazz idiom coming from a jukebox. I consider this score as the best vintage release by Goldsmith because of the extreme bareness of the exercice. → The Detective is typical of that era because of the hip Eastern Indian leaning through the use of sitar (see “Beach Scene”, “McIver’s Story”) combined with fender bass that you will hear in Escape from The Planet of the Apes and One Little Indian. The main interest of this updated crime jazz score is the complexe orchestration and the way the composer instills sounds. The tracks that I find the most challenging are “Joe” and “The Safe Cracker” that anticipe A Step Out of Line. According to Julie Kirgo, the jazz-inflected main theme that comes and goes all the time (see “The School Dance”, “The Ball Game”, “Karen’s Story”) is the prototype for the one from Chinatown. West Coast jazz players (bass player Red Mitchell, drummer Shelley Manne) are present as well as Henry Mancini’s musicians (guitar player Robert Bain, pianist Artie Kane). → Von Ryan's Express is a suspenseful military score with patriotic bits written like The Prize, “The Vulcan Affair” from The Man from U.N.C.L.E. (especially in “A New Crew”) and In Like Flint. A rather powerful score but that is not devoid of humour: see the crazy “Fire Sale”. The composer blends a piano, a weird buzzing Hammond synthesizer and pizzicati strings with many kinds of percussions from various nations, from snare drum to hand drums (bongo, maracas) and mallets (bells, lujon, marimba, vibes, xylophone). The ultimate tension-filled chase track that you must listen is “Dead End, Part 1”. An excellent double header by Jerry Goldsmith that is homogenous in quality in which the composer knows how to blur the instruments to fashion a peculiar soundscape. Sebastian is a hip late 60’s mod and spy score by Jerry Goldsmith. The soundtrack CD is divided in three parts: the album, the unreleased original recording and the cherry on top of the cake is the unused material of “musique concrète” composer Tristam Cary that decomposes like a music editor all the components of his track “Sputnik Code” in twelve effect channels defined as “code” and “loop”. In the album version, you find many influences dominated by a Fender bass and a triangle: a main and end title (“First Day at Work”) that sound like a blend of In Like Flint and Bandolero!, dated pop songs (“You Gotta Let Me Go” and “Comes The Night”) that you can skip on the spot, a jazzified Bach-oriented piece (“The Decoders” featuring piano, strings and a fast-paced snare drum performed with brushes) that anticipates A Step Out of Line, a pop Baroque track that starts with a harpsichord (“Checkmate”), a sad ballad dominated by a trumpet (“Carol’s Apartment”) a la A Step Out of Line again, a semi experimental Charadesque track (“The Trip”), Tristam Cary’s audio collage entitled “Sputnik Code”. By contrast, the original recording is fleshed out and seven tracks from the album are orchestrated in another fashion—not far away from the leaning of Lalo Schifrin’s Marquis de Sade—but it still contains a pop song (“Comes The Night”). The Man from FSM Lukas Kendall is credited as a project consultant. Breakfast at Tiffany's is a historical score by Mancini that is presented complete and in chronological order for the first time. The bulk of the music is Latin-jazz easy listening—i.e., Afro-Cuban jazz music like Mambo and Cha-Cha-Cha—combined with the theme song “Moon River” that is played and re-arranged in many guises: see the intimistic tracks “Poor Fred”, “An Exceptional Person”, “You’re So Skinny” and “Turkey Eggs”. You’ll also find the typical commercial Hollywood style of background humming in some tracks like “Holly”, “A Lovely Place”, “Just Like Holly”, “Let’s Eat”. The main interest and the best side of this recording lies in the suspenseful (see “Paul Meets Cat”, “Meet the Doc”, “Rusty Trawler”, “The Big Heist”, “After the Ball” which shines with its shifts and its coda) and dramatical (see “The Hard Way”, “Wait a Minute”, “Feathers”, “Where’s The Cat?”) tracks totally absent from the shallow RCA album. On the whole, Mancini excels in the orchestration because the general music is very fluid and inventive. I must admit I enjoy the big band track “The Big Blowout”. The soundtrack CD is cut in two parts: the original recording and the extras: five versions of “Moon River”, one alternate version of “Meet the Doc” (Without Organ Grinder), three source music cues entitled “Piano Practice”. The Man from FSM Lukas Kendall is credited as project supervision and in the Tech Talk From The CD Producer notes, Douglass Fake insists on his invaluable input. Days of Wine and Roses is a serious score by Mancini. The dramatical tracks (“Kissed in the Greenhouse”, “Some Laughs”, “They Fired Me”, “Vanilla, Part 1”, “Vanilla, Part 2”, “Get In the Tub, Part 1”, “Get In the Tub, Part 2”, “A Gone Mummy”, “No Guts”) are similare to Experiment In Terror. Neverheless, you find one semi happy tune (“Crazy Smell”) and some easy listening music all along: see “Hi-Fi I”, “Hi-Fi II”, “Gorgeous and Guilty”, “Silly”, “Off Scene Hi-Fi”. The Man from FSM Lukas Kendall is credited as producer. Hell is For Heroes is a good martial and tension-filled score foreshadowing Combat! and Battle for the Planet of the Apes. The score shows four ranges of theme: military march (see “Main Title”, “Back to the Line, “Battle Shock and Reese’s Rage”, “Kennedy’s Speech/End Title”), intimism (see “Reese”, “Off Limits Bar”), melancoly (see “Belligerent Reese”, “Homer’s Disappointment”) and suspense (see “The Mine Field, Part 1”, “The Mine Field, Part 2”). Composition-wise, the best track is “The Mine Field, Part 1” because of its variety of shifts. The Man from FSM Lukas Kendall is credited as executive album producer and writes the Tech Talk. Composer William Kraft is credited as a percussionist. A sure shot to be consumed liberally! The Gambler is a melancolic score based on Gustav Mahler’s Symphony No. 1 in D Major a.k.a. Titan that highlights the introspective-driven main character obsessed by gambling and Dostoyevsky’s Notes from the Underground. The iconic track remain “On the Morning After” (based on the first movement “Langsam. Schleppend”)—followed by “On the Morning After (Continued)—that sums up the character very well. The introduction motif of “On the Morning After” comes back in other tracks: “In the Bank”, “The Big Win”, “What Time Is It”. The tracks “Hips Comes to Visit” and “To Grand Pa’s House” are based on the second movement “Kräftig bewegt”. Both Greig McRitchie and Lennie Niehaus are credited as orchestrators. The source music reminds The Getaway (see the country track “Ricky’s Apt”) and The Super Cops (see the urban tracks “Howie’s Apt, Part 2” and “Harlem Bar Source, Part 1”). Three tracks have alternate versions to close the CD: “On the Morning After” (1), “The Big Win” (1) and “Finale” (3). The Man from FSM Lukas Kendall is credited as co-executive album producer. Beyond The Poseidon Adventure can be summed-up in terms of music like this: Lawman meets The Killer Elite! In other words, Fielding reworks two tracks (“Predators” and “Requiem in the Pasture”) from Lawman and blends it with the main title from The Killer Elite. But it features a sneaky cue called “Assault on the Fortress” from The Outfit too that is integrated in “They’re With Me”. It’s the ideal companion to Gray Lady Down because of the nature of the score. Two tracks (“Gun Fight” and “Great Escape”) make a reference to “Capriccio, Notturno e Aroso” from Witold Lutoslawski’s 1954 Concerto for Orchestra. The orchestrator is Lennie Niehaus who conducts three “promo reel” tracks in the Extras. The Man from FSM Lukas Kendall is credited as project consultant. Escape from Alcatraz is an uncompromising experimental, utilitarian, haunting and gloomy score that incorporates the method of “musique concrète” and can also be described as industrial music—in the popular electronic music sense of the word—because Fielding recaptures the inner sound of the prison’s buildings, materials and workers activities: the track entitled “The Pipe” is sustained by a cimbalom. Further more, the music even remind the path of Gil Mellé’s The Andromeda Strain and some tracks are atonal and can be connected to Delia Derbyshire’s cues for Inferno. The Main Title is a snare drum dominated track with a double layers of rising and invading esoteric sounds that come back in the course of the score. Some tracks are in the line of the Stockhausen-oriented Demon Seed and its “Closing Crawl” and Grey Lady Down because you recognize the typical use of synthesizer performed by Ian Underwood. The tour-de-force track remains “To The Finish Line” in which Fielding displays his palette of devices. Only Lennie Niehaus is credited but as a monitor. This original recording is lengthy and lasts 45 minutes but the soundtrack CD also provides three extras with one unused version of “Welcome to Alcatraz”. The Mackintosh Man is a sad piece of folklo-score dominated by cimbalom and accordion. 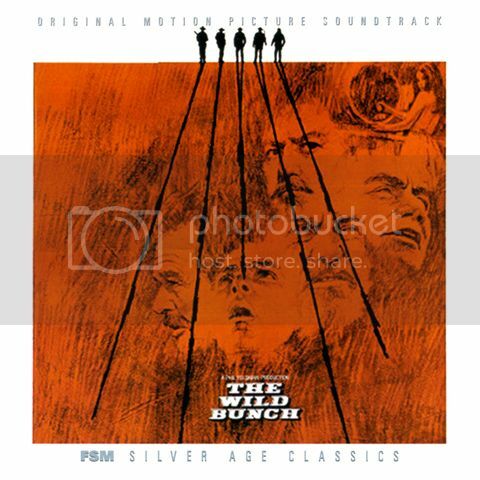 The recuring theme is played and re-arranged endlessly and “ad nauseam” and only two tracks are less obvious: see “The Pursuit” with its Ondes Martenot and “Escape Route”. In an odd way, the repetitive tune sounds almost like a node to The Third Man. Features two pieces of Greek source music (“Party 1” and “Party 2”) and two extras whose one is a pure delight because of its hipness: “The Mackintosh Man” (Single Version). Providence is a fancy, solemn, intimistic and melancolic score that reminds the grandeur of the Golden Age despite the chamber music main theme played by a slow piano. The composer still keeps his bigger-than-life signature but tames it and redirects it in a more somber way. The soundtrack combines the album version and unreleased tracks left from the original recording. The contents of the album version is splitted in many directions: the main theme (“Valse crépusculaire” has two piano renditions) and its epic interpretations (see “Générique”, “Providence”), the suspenseful moments (see “Feuillages”), the hectic chase music (see “Poursuite”, “Arrive dans la maison”, “La rue”), the deeply romantic side (see “Sonia et le Saint Suaire”, “Kevin et Sonia”, “Helen”). The original recording has fascinating dark and disturbing tracks (see “Le palais de justice I”, “Le palais de justice II”) as well as nice pastoral music (see “Plaisir de vivre”, “Le hérisson”, “Le déjeuner”). Highly recommended for all Rozsa collectors. Joe Kidd is an electric western score that emphasizes on modern-day (the electric piano, the electric guitar, the electric bass guitar, the buzzing or dissonant synthesizer, echo effects) or trendy foreign instruments like the cimbalom, the guiro, the maracas, hand drums. Through the main title, it’s also Schifrin mimicking the style of Ennio Morricone to fit the realm of Clint Eastwood but he goes beyond the simple parody. The majority of tracks were hardly heard in the finished film: 5 unused tracks and 4 partially unused. You can easily spot Schifrin’s musical devices: tracks like “Emilio” and “Manolo” (both partially unused) anticipate a score for an episode of Planet of the Apes: The Series because of the Eastern Europe feel. Schifrin recycles the string effects from the Bolero of Ravel that is played at the end of “Mingo” (partially unused). The score is a template for future soundtracks because of the distilled pointillistic effects but also borrow a lot from previous instruments use (moody flute and strings ensemble, menacing brass, sudden bell blows). This presentation does justice to the music conceived by the maestro. It makes a good companion piece to The Wrath of God in terms of hip leaning and to High Plains Drifter in terms of electric orchestration. 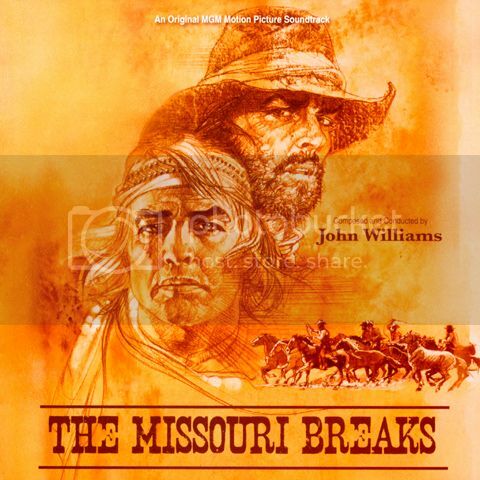 The Missouri Breaks is an unconventional and uncanny masterpiece of Americana music that relies on a theme and highlights the following instruments: guitar, electric bass guitar—the bassline is heavy and engaging—, harmonica, banjo, jaw harp, fiddles, electric piano, harpsichord and a series of percussions from folklo to exotic. The guitar leads the music and allows itself to play solo from time to time, especially in “The Cabbage Patch”, “End Titles”. The tracks that I enjoy the most are slightly Baroque (see “Logan’s Entrance”, “Clayton at the Wake (Unused)”, “Clayton’s Binoculars”, “The Drowning of Tod”, “Calvin”) or deeply atmospheric (see “Clayton’s Binoculars”, “The Cabbage Patch”, “Lee Chases Tod”, “Si and Cary”, “Calvin”). It’s a 2-CD set that includes first the original recording—never released before—and the album re-recording. Both versions are good. The original recording is rough, “rock” and even experimental and ends up with five extras. There’s a primitive and contemplative feel in the orchestration. A must have. This was an outstanding year for the 60s/70s collector, especially that handful great Fielding releases. I wonder what we will see by him in 2014? "Mission: Impossible" (Fielding, Schifrin, Ellis etc)? And I'm really looking forward to Intrada's "On the Waterfront"! Very nice selection and thanks for the breakdown. Does that mean we can look forward to an analysis of the Alcatraz score? ADD: Sorry, I found it now. Thanks again for posting this work. Certainly don't disagree with your selections, Thomas - as you'd expect. I've got most of them. I love the brassiness of The Carpetbaggers and recently I have been listening far more to The Wild Bunch. I suppose the only thing I'd disagree with is the statement that the Tristram Cary material on Sebastian is the "cherry on the cake"! That sort of thing just isn't my cup of tea (as a listening experience anyway...) I would say the same about Escape from Alcatraz, which was very daring and avante-garde but again on CD just gave me a headache. I'd love to see more tv releases from the 60's and 70's over the next year, but who knows...? I know your taste: you don't like "musique concrète" at all. I do believe that Goldsmith's "The Detective" is exactly the kind of score you like: see the use of sitar.